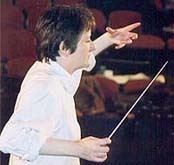 Lygia O'Riordan, conductor of Ensemble XXI, brought Handel’s Messiah for the first time ever to the Russian Far East. The youth and children’s choirs from the colleges and music schools of Sakhalin and the 'Cantores Minores Ensemble' of the famed Finnish boys choir from Helsinki, formed a joint choir. The brilliant soloists, Ludmilla Shilova, Jaewoo Kim and Hung Young Choi from the Australian Opera, the Korean State Opera and the Vienna Kammeroper performed alongside the Sakhalin soloists. The two performances of Messiah took place in a 1000 seat hall, which was full both nights. Master classes were held by Ludmilla Shilova and Dmitry Grigortsevich, who also gave a piano recital with an all Liszt programme. 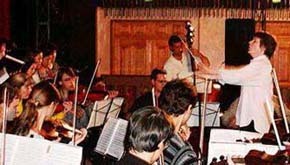 In between Messiah performances the musicians had time to have a picnic by the sea of Okhotks and taste caviar from fresh from double bassist Sergei Roumiantsv's freshly court salmon. The final night was a real treat for Sakhaliners with an operatic concert by international soloists at the Chekhov Theatre.